Form ever follows function - coined by architect Louis Sullivan, the principle is associated with 20th-century modernist architecture and industrial design which says that the shape of a building or object should primarily relate to its intended function or purpose. From the perspective of the journals involved in the exhibition – The Pickled Body, of which I am co-founder and co-editor, and gorse journal - it allowed us a frame from which to interrogate the function and form of our journals– from print and postcard, to websites and web-supported zines. gorse journal has a very physical presence, takes up space in a physical way– gorse publishes hard copies of each issue; each issue comes with its own piece of ephemera (whether it be pencils, pins, or playing cards). Issue 10 of gorse is a box. On the other hand, The Pickled Body exists in very much a digital space and place – each issue of the magazine can be viewed on-line using the ISSUU platform. That said, both journals move across the analogue/digital divide – you can access on-line pieces on the gorse website; podcasts with contributors as well as video and recordings from previous launches can also be accessed via their website, making it a very dynamic space for engaging with the art in words. In its first year, The Pickled Body printed poems on postcards. Launches were designed according to issue themes (ribbons strewn on the floor and postcards hanging from the ceiling were a feature of The Red Shoes launch) - all in an effort to bring the theme, the issue into a physical space; for the issue to take up space – both literarily and literally. The Illuminations Gallery was a prefect place and space in which to explore the way gorse and The Pickled Body engage with and use the analog and the digital – form following function – ever, somewhat, or never. We invited past contributors to both journals to take up the theme –although the final pieces submitted to us were made individually, or in collaboration between two artists, the works in the exhibition cohere into a journey from start to finish, speaking to each other across countries, media, and disciplines. Dimitra Xidous, from the introduction to the panel discussion with artists Ria Czerniak-LeBov and Fiona Brennan, held on Febraury 6th at the Illuminations Gallery. 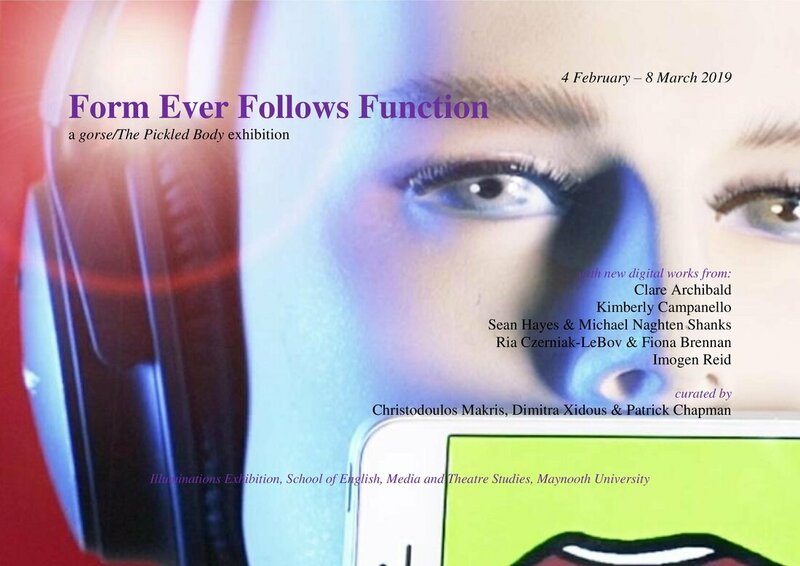 The Pickled Body and gorse, present a groundbreaking exhibition Form Ever Follows Function in which artists and writers from Ireland and other countries, come together in a spellbinding exploration of communication, expression, and creativity. Immerse yourself in the experience. Start at one end and follow through to the other — from the bracing emotion of Kimberly Campanello’s video-poem, to the fascinating study of Ria Czerniak-Lebov’s working practice; then on to Clare Archibald’s exploration of the spaces between words in different media; to the obliterature of Imogen Reid; to Sean Hayes and Michael Naghten Shanks’ meditation on human connection. Although they were made individually, or in collaboration between two artists, the works in the exhibition cohere into a journey from start to finish, speaking to each other across countries, media, and disciplines. Screen 1: Welcome to the show. Screens 2 and 3: Kimberly Campanello: Form Ever Follows Function. Video with audio track of original poetry. Kimberly Campanello is a poet and writer based in York. In 2018 she joined the University of Leeds and its Poetry Centre as Programme Leader for Creative Writing. Screen 4: Ria Czerniak-LeBov and Fiona Brennan – Etching in Memoriam. Video. 9 minutes. • Ria Czerniak-LeBov is a visual artist, printmaker and musician from Dublin. Her etchings have been exhibited at the Royal Hibernian Academy, Royal Ulster Academy, Graphic Studio Gallery and Impressions Print Biennale, among others. • Fiona Brennan is a Dublin-based film-maker who has exhibited films in the iJADE Conference in NCAD, Dublin in 2018 as well as for Culture Night throughout the country. She was Artist-In-Residence at Clancy Quay Studios, Dublin in 2017. Screen 5: Clare Archibald: Memories of Contort. Video, stills & motion, with spoken audio. “The vocal and harmonica are first-take with some background noise. This represents some of the spaces in between words and the digital and the written.” • Clare Archibald is a Scottish writer who likes to try stuff. Screen 6: Imogen Reid: from text to textile. PowerPoint presentation. Introduction/Statement and series of images – “treated book pages, overprinted and hard to read". Imogen Reid’s practice-based PhD focused on the ways in which novelists have used cinematic techniques in writing, and on the non-conventional forms of readability generated by those techniques. Screens 7 and 8: Sean Hayes and Michael Naghten Shanks: The Art of Friendship. Video, with audio based on a script inspired by, and appropriating interviews and articles about, the Japanese rent-a-friend industry. • Sean Hayes is an award-winning advertising creative director, and photographer. Born in London. Grew up in Dublin. He lives with his Belgian wife and children in Brussels. • Michael Naghten Shanks is a poet from Dublin.